To increase demand for its newest operating system Windows 8, Microsoft ran a promotion until January 31, 2013 that made available the operating system at a discounted price. Up until that day, you were able to buy Windows 8 for $39.99 as a downloadable upgrade for Windows XP, Vista or Windows 7. When you visit the Microsoft Store now, you will notice that the price for the the price for an Windows 8 Pro upgrade has gone up to $199.99, about five times the amount that you had to pay during the promotional period. While Microsoft's Store may be the obvious choice when it comes to buying a license of Windows 8, it is certainly not the best option as third party retailers are still offering Windows 8 discounts. 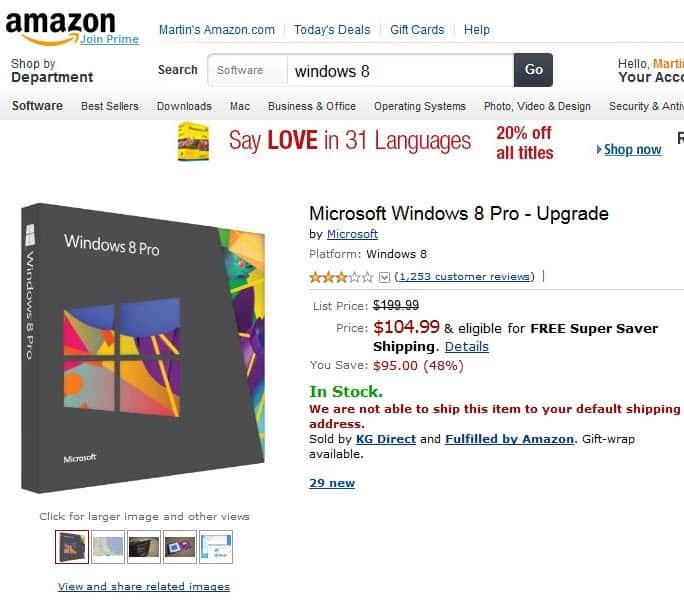 When you visit Amazon for instance, you will notice that the same upgrade that costs $199.99 on Microsoft's Store is available for $104.99 on the online retailers website. While that is still two and a half time the price during the promotional period, it is also $95 less than you would pay for at Microsoft's store. The System Builder editions of Windows 8 and Windows 8 Pro are also cheaper than the upgrade offered at Microsoft's store. You can purchase the Windows 8 System Builder DVD for $95.88 and the Windows 8 Pro System Builder DVD for $139.99 currently on Amazon. Not all online retailers are still offering a discount though. Newegg for instance is also listing the upgrade at $199.99. If you check price comparison engines like Pricegrabber you will notice that Amazon is not the online retailer that is offering the upgrade for a discount. The cheapest price at the time of writing is $89 at J&R. It makes perfect sense to compare prices before you buy a copy of Windows 8, regardless of whether it is an update or system builder edition. Discounts are not only available in the US though. I just checked the German Amazon website and found the Windows 8 Pro upgrade listed there for €52.99 which is about $70. Even though prices have increased you can still make a bargain if you compare prices before you make a buying decision. Saving up to $100 should be incentive enough to do so. In France, the price has remained the same (version system builder / OEM Pro 64 bit). I bought it on January 29 at this price. Well the System Builder price was not really discounted during the initial promo period. How much does the upgrade cost in France? Is it the same price as in Germany? On Microsoft Store France for the 8 version: 119,99 € and for the Pro version: 279,99. Sorry to nitpick, but doesn’t that phrase mean ‘to decrease/limit demand’? Good to see there are still discounts available at some retailers. I was always put off by how uniform 7’s pricing was across the board. It doesn’t sit right with me if every retailer sells a product at the exact same price point. I feel you… I put the word “curb” in my own language translator and I got: Nouns (4), Adjectives (1), Verbs (2). They’ve one word for 1000 meanings. It’s normal to be confused some times. Even native English speakers can get it wrong.